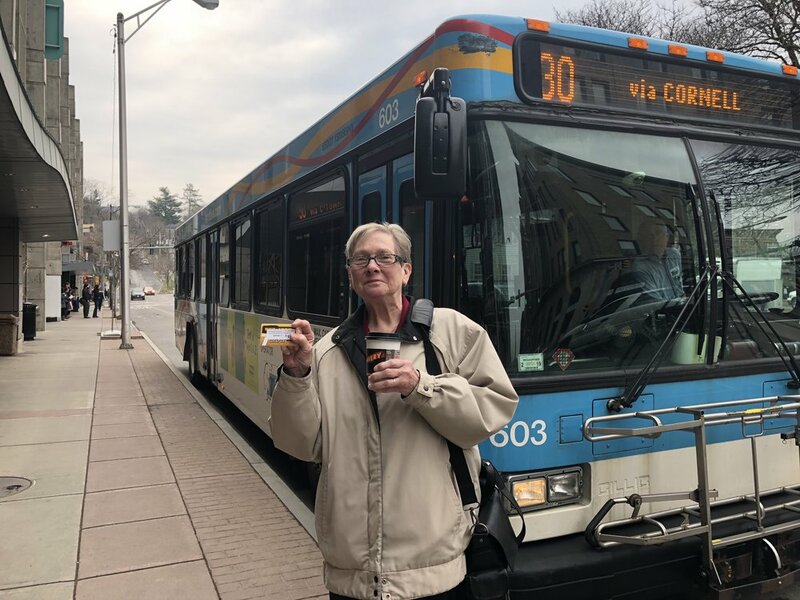 Kim Falstick poses in front of the Seneca Street TCAT stop. Kim gave up her car in 2005 and has seen the benefits of public transportation manifest in every aspect of her life! Kim Falstick, 64, hasn’t had a car since 2005. Everyday, she takes the TCAT to get where she needs to go. Originally from Geneva, Kim and her partner, Maureen, live outside of the City of Ithaca in Enfield, New York. Kim said that not driving a car saves her approximately $3,590 a year. The biggest cost of owning a car, she said, was paying $200 for gas each month. She said her old car needed many repairs and that she was tired of paying for the rising price of gasoline. “My car was getting older, and it was getting more repairs, so the first thing was finance,” she said. Now, she gets where she she needs to go for under two dollars a day. She also has a reduced fare as she is a senior. She said road safety played into her initial decision to give up her car. She was working for Wegmans and had to get to the store early in the morning before roads were plowed. She said she found riding the bus to be a safer means of getting to work. “I started riding the bus when the weather was bad, and I thought, ‘Oh, this is pretty cool. Why couldn’t I do this all the time?’” she said. She said riding the bus daily allows you to make new friends as you see the same people that make up the base of TCAT’s ridership. She said she made friends with a woman on the bus who comes to her house for Thanksgiving each year. She also said that for many people, riding the bus is an opportunity to learn about other people. She said that she does not regularly use a mobile phone, and her willingness to connect with the world is something that has allowed her to get to know people from all walks of life. She also said there are numerous health benefits to giving up your car. She said she still sometimes wishes she could jump in the car and go somewhere, but that she is now in excellent physical shape as a result of walking everywhere. “If I have a couple of days where I’m home, and I’m not downtown and I’m not walking, I miss it,” she said. Kim also said that it was only several years later that she realized the environmental benefits of her decision.